Bangkok has joined the ranks of London and New York with its own branch of the Madame Tussauds Wax Museum. The famous museum featuring life-like wax models of international celebrities, politicians, and historic figures is located in the Siam Discovery Center Mall. Admission is THB800 (USD26) for adults and THB600 (USD20) for children age 5 – 12. Madade Tussauds Bangkok officially opened in December 2010. The museum features a diverse collection of more than 70 life-sized wax figures that include Michael Jackson, US President Barack Obama, the Dalai Lama, Brad Pitt, Will Smith, and Einstein. Giving it a uniquely Bangkok spin, about 30% of the wax figures are notable Thai people — visit the Leaders Zone to shake hands with former Prime Minister Prem Tinsulanonda or the Music Zone to pose with Thai pop singer Tata Young. Guests can get up close and personal with the wax figures and there are many great photo opportunities. Potential visitors to the museum can save time and money by purchasing their tickets online. Not only will you get to skip the admission queue, but the museum regularly offers discounts and promotions for online ticket purchases. Currently, online ticket holders receive a complimentary photo and souvenir. Tickets can also be purchased at the museum on the 6th floor of Siam Discovery Center. 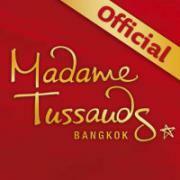 Madade Tussauds Bangkok is open daily from 10am – 9pm. For more information visit the website or call (66) 2658 0060.